Libya's crude output has been cut by up to 100,000 b/d after an attack on an export pipeline to the Es Sider oil terminal, state-owned National Oil Corp said Sunday. Investigations into the cause of Saturday's explosion are continuing. Upward pressure on oil prices will also be seen this week after OPEC and non OPEC producers rejected accusations by US President Donald Trump that they were artificially fixing oil prices. The ministers were meeting in Jeddah Friday to review progress of their campaign to reduce global oil stocks when Trump made the claim via Twitter. 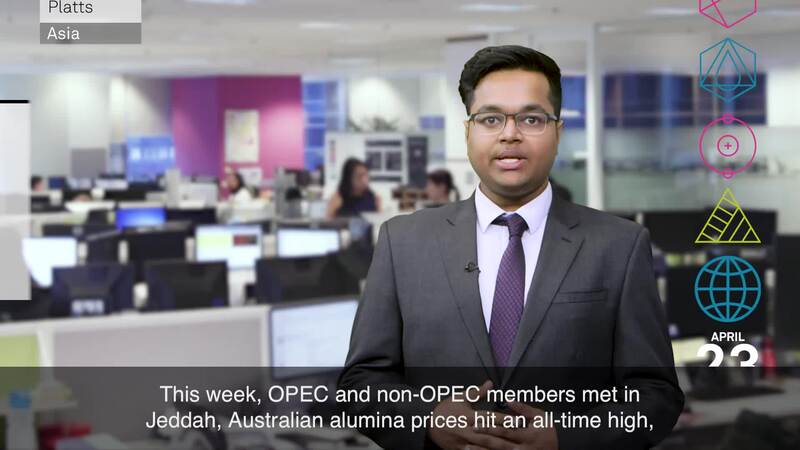 Associate editor Srijan Kanoi looks at these and other factors that could drive commodity markets this week. But first, in oil, Libya's crude output has been cut by up to 100,000 b/d after an attack on an export pipeline to the Es Sider oil terminal, state-owned National Oil Corp said Sunday. Investigations into the cause of Saturday's explosion are continuing. So here’s what we want you to tell us via Twitter with the hashtag PlattsMM: Do you think Brent crude will hit Saudi Arabia’s target price of $80/b this year? Elsewhere in oil, Far East Russia's ESPO Blend crude may face pressure this week as China's independent refiners plan to cut run rates. The launch of stricter tax reporting rules in China on March 1 has resulted in narrower refining margins, prompting independent refiners, for whom ESPO is the favored feedstock, to cut output. Moving to metals, and Platts’ alumina assessment hit a record high of $710/mt FOB Australia last week. This came on the back of US sanctions on Rusal and production cuts at a Brazilian refinery due to environmental problems. With Australian alumina at a $350/mt premium to domestic prices in China, Chinese producers are now keen to export. In agriculture, China imposed a 178.6% import duty on US sorghum last week and, as a result, 12 to 18 distressed cargoes were seen looking for homes in Asia. Sorghum offers into Thailand and Vietnam have been heard as low as $140/mt, at a more than a $50/mt discount to corn. Traders said cargoes that do not find their way into China will likely eat into Southeast Asia's feed demand for corn and feed wheat in the coming weeks. In thermal coal, the Chinese market will be watching to see if Beijing sticks to its port restrictions on thermal coal imports this week, as the move begins to drive up domestic coal prices. The unexpected side-effect has already pushed up domestic coal prices at Qinhuangdao port by Yuan 15/mt. And finally, in LNG, the market is focused this week on whether persistent oil price strength will support LNG spot prices. If oil prices remain strong, then relatively low oil-slope equivalent prices could spur opportunistic buying of LNG by end-users. However, fundamental demand remains tepid. Thanks for kicking off your Monday with us and have a great week ahead!